Katerina earned a degree in dentistry at Aristotle University of Thessaloniki in Greece. She has more than 16 years' experience practising in the UK NHS as well as privately funded Orthodontics, treating adults and younger patients alike. At Studental, she offers Orthodontic treatments on a private basis only. 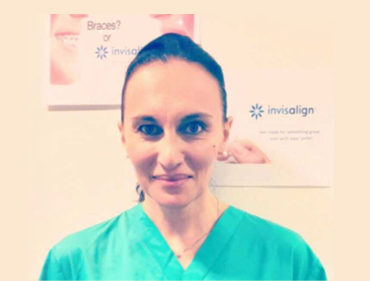 She has recently completed the European Masters of Aligners Course and is a certified Invisalign provider, a member of British Orthodontic Society and European Aligner Society. Katerina prides herself in truly listening to and addressing her patients' concerns and practises within a comfortable, relaxing, state of the art dental clinic. She finds extremely rewarding the life enhancing effect and increased confidence her patients present with following – or even during – their bespoke orthodontic treatment. In addition to Invisalign full range of treatments, Katerina also offers highly aesthetic ceramic fixed appliances (passive and self ligating) as well as removable appliances (including Inman Aligner) to address all patients' needs. She offers complimentary initial consultations to discuss your requirements, flexible payment plans and opening hours to accommodate busy lifestyles.